Market is playing catch up! We had a bunch of errands to run in Merced and decided to stop off at Costco. 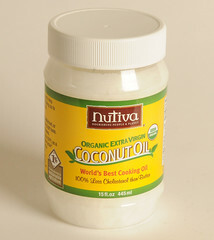 They were having a sale on Nutiva Coconut Oil – 74 oz. for $14.99 – organic. For that price I can’t help but wonder if there isn’t something wrong with it. I’ve got five in the pantry and I’ve been using one for what seems like forever. I can’t find a thing wrong with it. I have to say I was pretty dismayed at the amount of organic food available. I was looking for organic staples: flour, sugar, corn meal, rice and beans. What I found was crackers, soups, cookies and other assorted items of prepackaged food that I don’t trust anymore. I’m tired of buying stuff with things I can’t pronounce and ingredients I have no idea what they are. If I can’t make it in my kitchen, our family is not going to eat it. I was happy to see they had packages of grass-fed ground beef that were very reasonably priced. Sadly, they didn’t have any other types of organic beef or any other organic meats. The Modesto location seems to have a better selection, but I haven’t been there for awhile, so it’s hard to say. There are deals to be had in the organic market. Look for deals on beef during the month of October. When you find them though, stock up because once the supply is gone, the price shoots back up, and it’ll stay up until Spring. Consider canning the beef, chicken, pork, etc… instead of freezing it. The meat will last longer and will be tastier, and most of the cooking will already be done. It’s just a real nice thing to have on hand. I think we’ll find a lot of organic food to choose from come Spring. Plan ahead. What does your family like to eat? Make a list! What items would you like for them to start eating? Search for recipes that use those items. Buy extra when items are cheap and either can, freeze or dry them for later. Really, How Much Better Is Grass-Fed Beef? As the popularity of green product claims continues to spread, it’s important to understand the claims you can trust and the ones that are fooling you. Since the kitchen is the hub of the household and is said to harbor more bacteria than even the bathroom, it’s seems to be the most obvious place to start to be more conscious about cleanliness and the environment. There are conscious choices and products you can easily incorporate into your kitchen to make it a healthier, more eco-friendly environment for everyone. Below are some tips and trusted kitchen products for a greener kitchen. Earth Friendly Products is the leader in the development and production of environmentally friendly cleaning supplies for household use with over 150 products manufactured with only sustainable plant-based ingredients that are safe for people, pets, and the planet. The company proudly adheres to its strict “Freedom Code”, a list of harmful and toxic ingredients that are not found in any its products. GreenPan is trying to educate Americans about the harmful effects of traditional non-stick cookware. Less energy is used in the application of Thermolon coatings onto the GreenPan product itself. This results in a 60% reduction in CO2 emissions during the manufacturing process compared to the application of a normal PTFE based coating. PaperChef, a Toronto-based company founded in 2010, developed a line of products that includes parchment rolls, parchment cooking bags and parchment baking cups. Sustainability and cleanliness were highly important, resulting in packaging made of 100% biodegradable FSC recycled paper printed with vegetable based inks. Storing and cooking with paper-over foil and plastic-is more natural and better for both humans and the environment. The French method of cooking “en papillote”-a parchment-style method steams food to perfection and enhances natural flavors, without synthetic sprays and high-fat oils for simple, healthy meals. Entire meals can be cooked in a bag, which can then be re-recycled or composted. Harvested using natural farming practices, all of Teatulia teas are cultivated without the use of pesticides, machinery and unnatural irrigation. The Teatulia garden was started in 2000 in order to give back to the community in a meaningful way. With 50% of the population below the U.S.poverty line the company sought to establish a business that would both protect our environment and provide a means to a living wage for the surrounding community therefore establishing the garden as a cooperative open to the workers and neighbors in surrounding villages. Each tea has its own unique, health benefit.